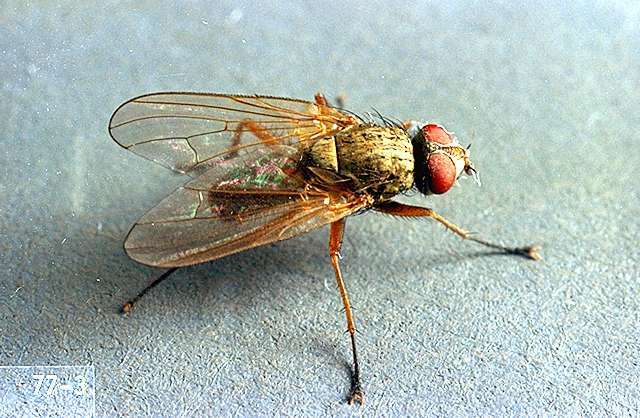 Pest description and crop damage Adults are small black to gray flies with yellow markings. The body is covered with long, stiff bristles. 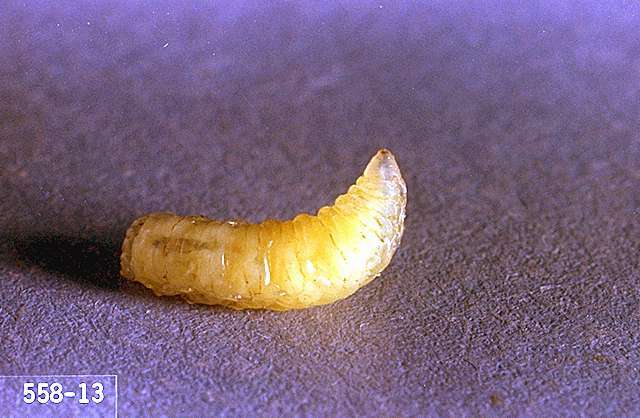 Larvae are nearly translucent white or yellow and about 0.25 inch long when mature. Eggs are white, cylindrical, and laid singly or in small groups. Adult leafminers may stunt seedlings by attacking the cotyledons in seeds. Larvae mine between upper and lower leaf surfaces, creating winding, whitish tunnels that initially are narrow, but then widen as the larvae grow. Excessive mining renders leaves unmarketable, reduces photosynthetic capacity, and provides easy access for disease organisms. Biology and life history Leafminers overwinter as pupae in the soil. Adults emerge in late May, mate, and females lay eggs on the undersides of beet and chard leaves or on lambsquarters. 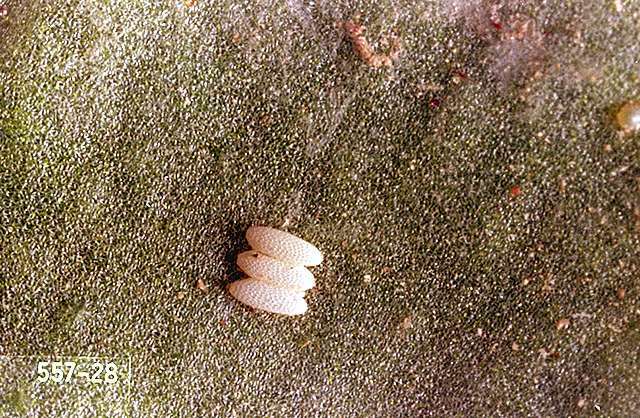 The eggs hatch in about 4 days, and the small maggots eat into the leaf. There may be several maggots in a leaf. When mature, larvae fall to the ground and pupate just under the soil surface. Adults emerge in 10 to 25 days and begin laying eggs for another generation. There are at least three generations each year. Pest monitoring Regularly check young seedlings for leaf mines. Most mines occur on cotyledons and the first true leaves. Some mines are more visible when seen from the underside of the leaf. 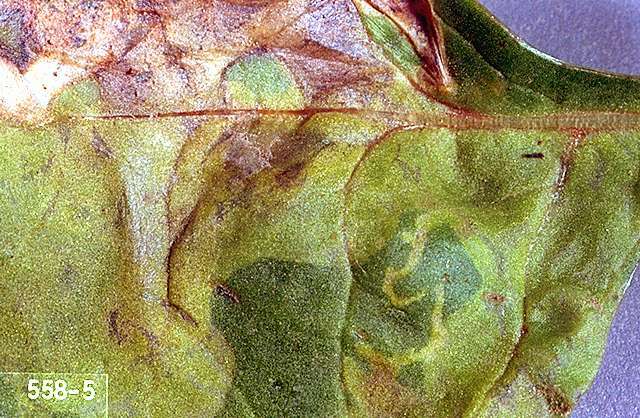 If leafminer populations build to high levels when seedlings have four to five leaves, a chemical treatment may be necessary. Treat if you find more than an average of one mine per leaf in your overall field sample. To be effective, sprays must be applied to the larval stage. Natural enemies, especially parasitic wasps, commonly reduce populations of leafminers, unless they are killed off by insecticides applied to control other pests. To avoid killing beneficials, choose selective pesticides for treating other pests, whenever possible. Other parasites attack leafminers, but because leafminers feed within the leaf, they generally are protected from most predators. Liriomyza leafminers attack a wide variety of vegetable crops. Where possible, avoid planting next to infested fields, especially those near harvest. Postharvest disking of fields destroys pupae and reduces migration of adult flies into susceptible fields. Apply floating row covers to the plants during April to May. Controlling infested weeds, especially lambsquarter, may help in control. Rotate crops from one year to the next so they are not planted in previously infested areas. No spray is advised on beets grown for leaf tops. plant essential oils (peppermint, rosemary, etc. )-Some formulations are OMRI-listed for organic use. spinosad (Success) at 0.07 to 0.16 lb ai/a. PHI 3 days. REI 4 hr. Treat eggs at hatch and small larvae. Retreatment interval 7 days. Do not exceed 4 applications or 0.33 lb ai/a per crop. Spinosad takes several days to achieve full effect. Monitor fields and pest populations carefully. Multiple applications may be necessary. A penetrating surfactant or oil is critical for optimal control of leafminers. Consult the adjuvant section. on spinosad labels. Some formulations are OMRI-listed for organic use.